Facebook states it’s introducing the new rules in order to curb predatory schemes. “We want people to continue to discover and learn about new products and services through Facebook ads without fear of scams or deception. It lists the following slogans as examples of the types of ads it intends to stamp out. The news marks the latest development in a stream of changes the social network has made or committed to. On Jan. 29, Mark Zuckerberg announced on his personal Facebook page that the site would ramp up local news in News Feed. Earlier this month, it announced it would prioritize posts from friends and family over news outlets and brands in News Feed. Yet this announcement also comes not long after Mark Zuckerberg hinted at an interest in cryptocurrency. In a Facebook post from Jan. 4, he described cryptocurrency as a “counter-trend” to the internet’s centralized systems—which Facebook itself in many ways represents. 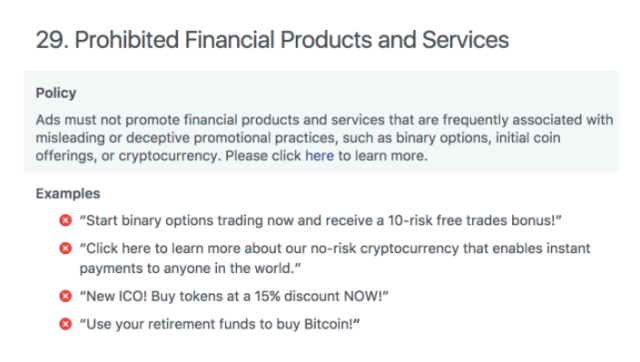 That’s led some to be sceptical that Facebook is introducing the policy to curb scams, and speculate that the company will launch a cryptocurrency or blockchain product of its own.